However, it could have been much better for Chelsea and worse for Liverpool when Costa went to ground under challenge from Joel Matip 14 minutes from the end. 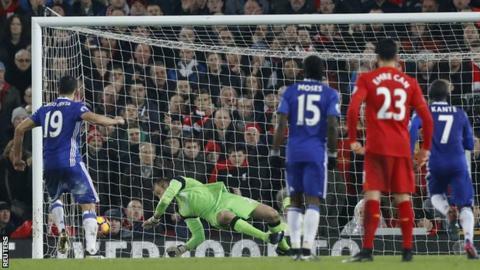 Referee Mark Clattenburg pointed to the spot but Mignolet dived low to his right to save the Spain striker's spot-kick. N'Golo Kante was again immense as Chelsea extended their lead at the top of the table. The defensive midfielder's work ethic peaked as Liverpool dominated possession. Chelsea have another huge Premier League game coming up - they entertain Arsenal (12:30 GMT) in the early kick-off on Saturday. On the same day, Liverpool are away to struggling Hull City (15:00). Match ends, Liverpool 1, Chelsea 1. Second Half ends, Liverpool 1, Chelsea 1. Attempt blocked. Marcos Alonso (Chelsea) left footed shot from outside the box is blocked. Assisted by Pedro. Attempt saved. Roberto Firmino (Liverpool) header from the centre of the box is saved in the centre of the goal. Assisted by Sadio Mané. Substitution, Liverpool. Divock Origi replaces Adam Lallana. Attempt missed. Pedro (Chelsea) left footed shot from outside the box is close, but misses to the right. Assisted by N'Golo Kanté. Cesc Fàbregas (Chelsea) wins a free kick on the right wing. Hand ball by Nemanja Matic (Chelsea). Substitution, Chelsea. Cesc Fàbregas replaces Willian. Corner, Chelsea. Conceded by Simon Mignolet. Penalty saved! Diego Costa (Chelsea) fails to capitalise on this great opportunity, right footed shot saved in the bottom left corner. Penalty conceded by Joel Matip (Liverpool) after a foul in the penalty area. Penalty Chelsea. Diego Costa draws a foul in the penalty area. Substitution, Liverpool. Sadio Mané replaces Philippe Coutinho. Jordan Henderson (Liverpool) wins a free kick on the left wing. Attempt blocked. Emre Can (Liverpool) left footed shot from the right side of the box is blocked. Assisted by James Milner with a cross.